These squeeze bags are all the rage with the kids. This picture cracks me up because of how giant Callan looks and because of Luke's expression -he looks fierce! As I rocked you last night, I thought about how I used to sit there and hold you in one arm, with your head nestled perfectly in the crook of my elbow and your feet in my palm. And now a year later, your legs are all squished and oozing off the sides of the chair and your whole body sprawls across my body in a way that can't be comfortable, yet you still manage to fall asleep. I know you won't tolerate being held and cuddled as much the older you get, but I hope to always steal a few minutes of quiet time together because I will always have time for a kiss and a cuddle with you. p.s. It already is getting hard to take pictures with you. I have a lot of these kinds of pictures where you just are trying to get away (or get whatever I'm holding). Oh boy. A year ago (almost exactly to the minute) this little baby showed up for me to love and today I have this crazy, energetic, full of personality little boy. They say the first year flies by and holy moly, they are not lying. 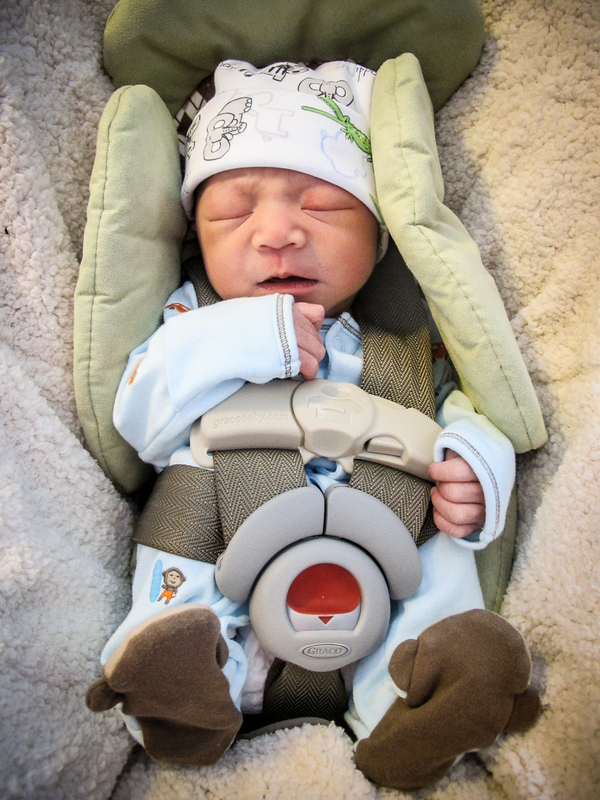 When you first arrived and I got to see/hold/hear you for the first time, I was surprised by how calm the whole experience was for me. 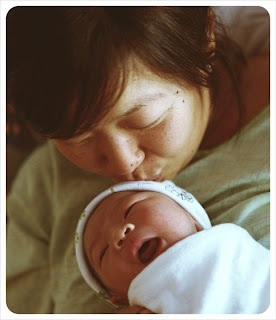 I've heard of people becoming overwhelmed with emotion - bursting into tears because of their overwhelming love or anxiety due to the sudden realization of becoming a parent, or finally realizing the full magnitude of how their lives have changed, etc and I was surprised at how I didn't feel any of these things. It actually concerned me a little bit, but then I realized it wasn't because I wasn't overwhelmed with my love for you, it was more because you made sense and fit into my life. It was like finding something you lost before you realize you lost it and you were the missing piece of my life that filled the gap before I even knew it was there. It just seemed natural to have you and even though my life has never been, and never will be the same, I can't even fathom it without you in it. I can't imagine what I would be doing without you and I know that my life would just be a shadow of the life I know now. Many people wonder about their legacies, about the meaning of their lives or what they are worth... and with you, I don't have that doubt or wonder. I know that you are going to be an amazing person because even though you are only a year old, I can already start to see the person you are going to become, and I know that you are going to be someone I will always be proud of, and more importantly someone you will be proud of being. I hope that I am the mom you need and deserve and can help you grow and develop into that person. Every life will have some bumps, but I hope yours are small. I won't be able to prevent you from making mistakes, but I will be there to help you recover from them and learn from them. Already you have turned into this kind, funny, generous, loving, good natured boy and the world, especially mine, is better off from having you in it. Happy birthday Callan! You are the best little boy anyone could ask for and I am constantly awed by you. This past year has been amazing and I can't wait to see what the next year has in store for us -I don't know exactly, but I do know that we are in for some great adventures. I love you forever and always. Wow, this post is late... I wanted to write a recap about our first Easter, but then I realized that this wasn't actually our first Easter as a family.... Even though Callan isn't quite a year yet, he was here for Easter 2011 -in fact, he was 3 days old and we were discharged from hotel Prentice that day. Look at this muchkin getting ready for his first car ride home! 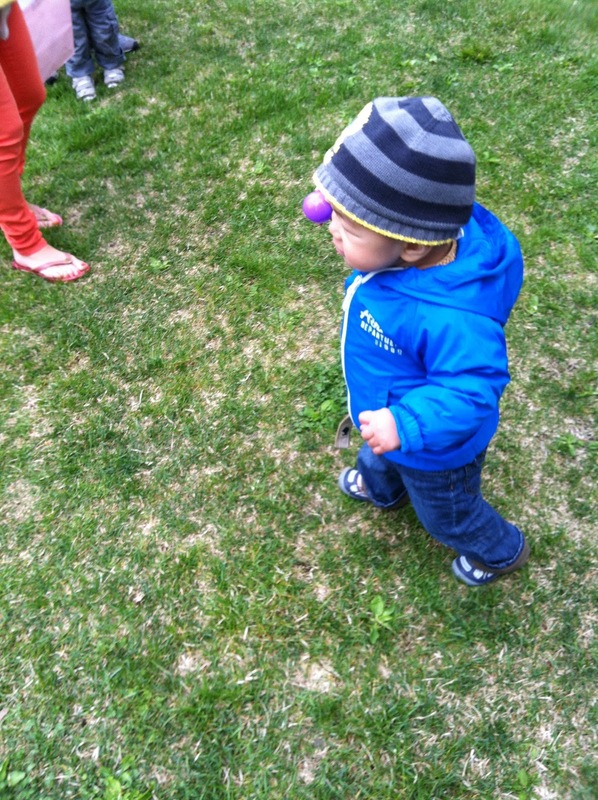 And now look at him this Easter -he's such a different person. Anyway, Easter 2012 was a great success! The Easter bunny came and gave Callan a stacking train toy and some empty Easter eggs (don't tell him that there's usually candy in those eggs as he was more than happy playing with the empty ones). Callan decided that Easter was so exciting and pretty much refused to nap all day (finally got him down for an hour nap -but for reference he usually takes two naps and sleeps closer to 3-4 hours during the day), but he was still pretty great. We had the Cassidy-Bach's come over for an afternoon play date and then our friend Denis along with the Martin family came over for dinner. It was the first weekend Huge had been home for awhile, so it was nice to spend the time together with friends and family, and overall a great Easter. weekend. 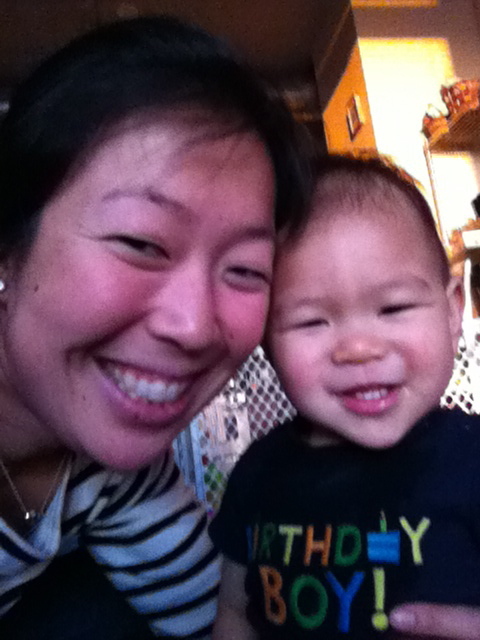 Next up is Callan's 1st birthday party! Eek. All smiles for Cubs opening day! Callan must know that means it's almost summer. The park near our house hosted an Easter egg hunt and I thought it would be a fun event to go to with Callan especially since it was supposed to be around 70. 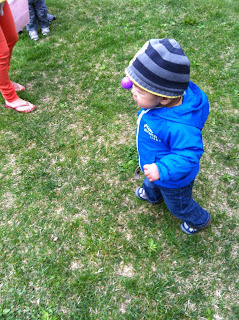 Unfortunately it ended up being a bit chillier and in the 50s, but still nice enough to run around outside. When we got to the park there were a ridiculous amount of kids and the park was covered with brightly colored plastic eggs. The event started at 11 and by 11:15 the park was picked clean! 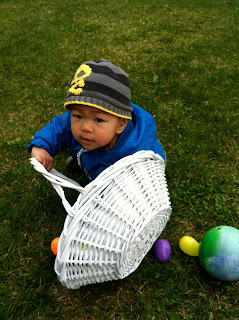 Callan got a few eggs, but he was more interested in running around with the basket. Sadly his mama's a bit of a slacker so the basket was a last minute idea and the one we used was a little big so he had to hold it above his head to keep it from dragging on the ground (and tripping him). He's at the stage where he loves putting things in and out of things and trying to figure out how things go together, so he loved putting the eggs in the basket and playing with the egg halves. I would say that the first Easter Egg hunt was a success. Oops, I think Callan could fit in the basket!